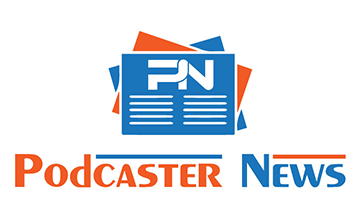 International Podcast Day is dedicated to promoting podcasting worldwide through education and public engagement. It’s the podcast version of things like National Pancake Day (and other one-day celebrations of a specific thing). The official International Podcast Day is September 30. 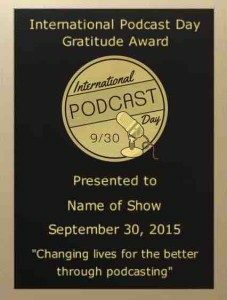 There is an International Podcast Day Gratitude Award that will be awarded to one podcast. The purpose of the award is to recognize the podcast with the most engaged global audience, as measured through international podcast reviews in iTunes. They made it fairly simple for podcasters to enter their podcast into this competition. First, you have to register your podcast on My Podcast Reviews. That website is run by Daniel J. Lewis, host of The Audacity to Podcast. It collects up your international podcast reviews for you. After you sign up with My Podcast Reviews, it will collect your reviews and display them on the site. Users who have a free account will see the most recent 30 reviews. Premium users will see their complete archive of reviews. For the purpose the International Podcast Day Gratitude Award, My Podcast Reviews will automatically check your reviews in all 155 iTunes stores through September 27, 2016. The podcast that has the greatest proportion of international reviews will win the gratitude award. After you register your podcast with My Podcast Reviews, the second thing you need to do is ask your audience to write reviews about how your podcast has impacted their lives. International Podcast Day recommends that you should especially encourage those who are listening from outside the country to write an iTunes review for your show.